When my goal is to cook seasonally, and/or with what’s available at my local market, I find myself again and again reaching for one of my favorite cookbooks from 2017; Jeremy Fox’s On Vegetables - Modern Recipes for the Home Kitchen. The book obviously highlights vegetarian recipes and as Jeremy got his start in northern California’s Napa Valley, well - it just makes sense. And as a home cook with a home kitchen - this book has provided me with an endless supply of interesting dishes while at the same time being very approachable. A lot of the recipes are quite layered which can sometimes make home cooks wary, but in making these dishes, I’ve learned how each component comes together to add character, flavor, texture and an overall balanced plate of good eating. This recipe is made up of a lot of parts, but they’re all easy to make and so really, it’s just about getting your sh*t together. The concept of “mise en place” - putting everything in place - should rule you in the kitchen. IT MAKES COOKING SO MUCH EASIER. And enjoyable. I promise. I had a friend ask me why I photographed a plate of food on the back of a cat … which I thought was an honest question and quite funny. I just like a lot of texture in my pics I guess! The plate is actually sitting on a faux-fur stool in my living room. This recipe is actually a dessert featured in the book, but it felt more like breakfast to me, and so I ate it for breakfast every day that week and secretly hoped Jeremy wouldn’t mind. But you could totally do this as dessert. I will look the other way if you have access to delightful creme fraiche at your grocery store. I rarely do so I’ve learned to make it myself (and it’s drop-dead easy), but you go ahead and purchase it if you’d like. Just keep in mind that creme fraiche takes a couple days to make, so plan ahead if you’re making your own. But please, make the curry spice for the Curry Cashews. Nothing compares to freshly ground spices and roasted nuts. I was fortunate enough to come across some local buckwheat honey when I visited my sister up in Winlock, WA this past summer. It’s a lot darker and deeper in flavor than wildflower honey, but you can use your favorite honey of course. 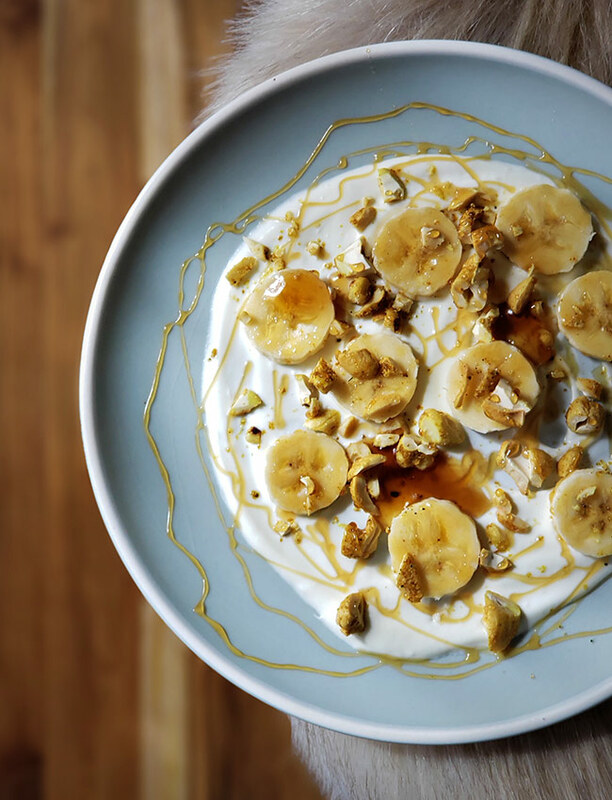 I hope you enjoy this recipe, for breakfast, for dessert, for whenever. Spoon a base coat of creme fraiche in each bowl. 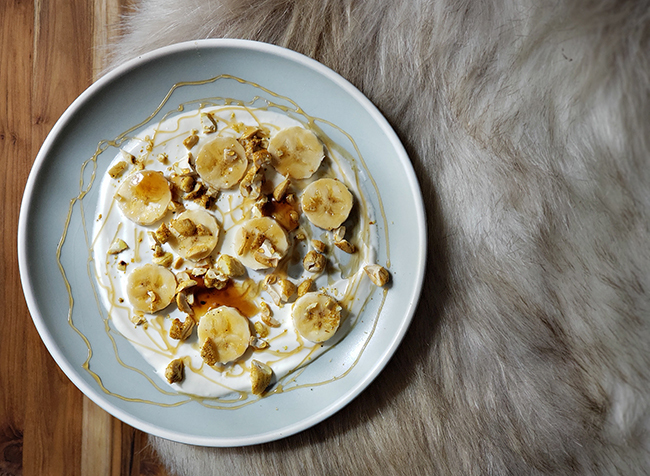 Arrange the banana slices on top, drizzle with honey, then finish with cashews and flaky sea salt. Combine the heavy cream and buttermilk in a glass or plastic container and let it sit, loosely covered, on the counter for up to 24 hours. Once the creme fraiche begins to thicken, cover the container and keep refrigerated for up to 1 week. For curry cashews, and for whenever you need a good curry spice! In a wide saute pan, combine the curry powder, turmeric, fennel seeds, cumin seeds, mustard seeds, peppercorns, chili flakes, mace and cloves and toast over medium heat, stirring, until fragrant, 3 to 4 minutes. Transfer the spice mix to a spice grinder and process until very finely ground. Transfer the curry to an airtight container and store at room temperature for up to 2 months. Preheat the oven to 300-degrees F.
Spread the cashews on a baking sheet and roast the nuts, toswsing occasionally, until they are golden all the way through and not burned or bitter, about 20 minutes. Let the nuts cool to room temperature. Toss the cooled cashews in a bowl with just enough olive oil to coat. Finish them up by tossing with the sugar, curry spice, and salt. Eat immediately or store in an airtight container for up to 1 week at room temperature.